Somehow it’s only been two weeks since we started our adventure. It feels like we’ve packed so much into our time whilst also still being very relaxed; a nice combination of running around and chilling. During my last post we’d just arrived at our open shack near Can Tho. We did a floating market tour of Can Be (the largest floating market in Vietnam) and the nearby land market where we got to try some new Vietnamese food: Bird’s ear (not actually made from bird, a deep fried sweet desert type thing) and beefcake (again no meat; sticky rice based cake). We also got to try some fruit that I’ve never seen before which tasted like Lychee. After saying goodbye to the 5 cats, 2 dogs and Bacon the pig we headed up to Chau Doc, a border town between Vietnam and Cambodia. Having heard in advance that the town was a bit of a dump (it was) we headed slightly out onto the sacred Nui Sam mountain, which towered over the rest of town which was completely flat. 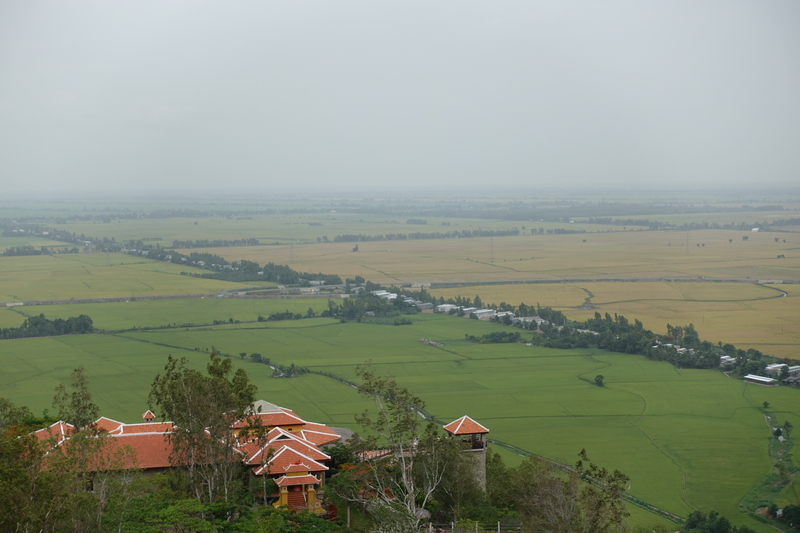 Despite the dull weather the views were absolutely stunning, with Cambodia visible in the background and the farmers burning the excess organic material near by, fields of freshly planted rice in yellow and ready to harvest fields in green. Being low season there were only 5 or 6 people in the entire resort, which whilst eerily quiet allowed us near exclusive access to the pool. We then moved onto Cambodia via speedboat. Not as glamorous as it sounds, as they’d overbooked the boat so we didn’t have a proper seat indoors but had to go onto the wooden benches out back for 5 hours. I’m glad we did though as we got to see life on the Mekong as we travelled between the countries, and my amazing travel cushion made the journey bearable. The border itself has to be one of the laxest attempts at security I’ve ever seen. The waiting area was a big garden, there were no queues or immigration areas. People just mulled around whilst the guide acquired our visas and our passports got stamped. It would be very easy to get past if you were so inclined! 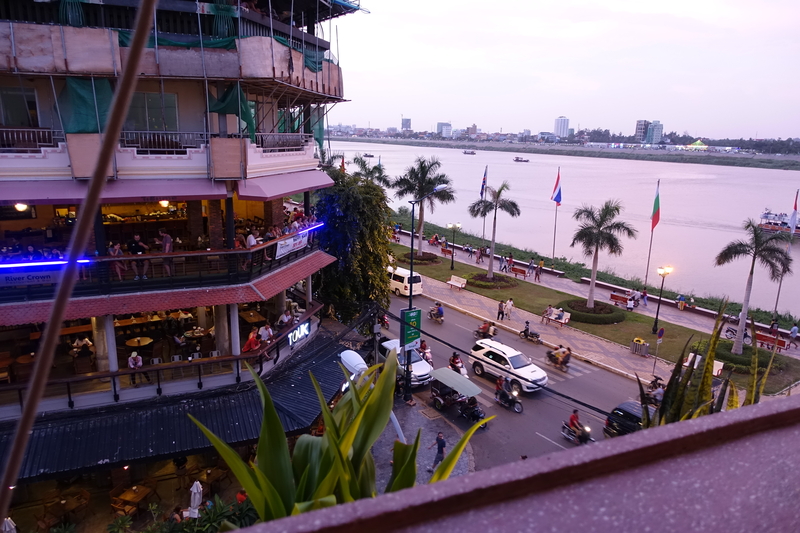 Eventually we arrived in Phnom Penh, which was nothing like we expected; The internet had sold us stories of it being a recovering city, and we were expecting something even more run down that Ho Chi Minh. We were very wrong; Phnom Penh is more like Bangkok than anything else, and is highly internationalised. Restaurants of all different kinds of cuisine (including Mexican, which was a nice treat), tons of fancy shopping and guesthouses, pavements which were walkable and an amazing waterfront make this into a true cosmopolitan city. The only problem was that it is much more expensive than we imagined. It was so hot that you couldn’t walk around, and the only transport option is tuk tuk; There were no public busses we could see. Each trip comes to $2 or $3 which quickly adds up over a day. Whilst food can be cheap (we got a curry and pad thai for $1.5 each at the night market) it can also get western-pricey, which resulted in us breaking our budget on a couple of days. Interesting aside; The currency here is bizarre. For transactions over $1, US dollars are generally used. For anything under, the local currency “Riel” is used at a conversion of 4000R to 1 USD. You need to be quick at maths to ensure that you’re not getting ripped off by the tuk tuk drivers! Mid way through our stay we decided to go on a bicycle tour to the Killing Fields and Mekong Islands. Less than 40 years ago Cambodia suffered a Genocide at the hands of the Khmer Rouge with millions of the population killed, often at one of the hundreds of “Killing Fields” around the country. The largest is located 15km south of PP, and was a truly harrowing experience. In a central monument they have placed thousands of excavated skulls, arranged by age, along with the weapons used to kill them; bullets were too expensive so executions were normally done with hand weapons like bats or much worse. Whilst I’m glad we went, there is something deeply unsettling about walking atop human remains. The government has left a number of the mass graves unexcavated as a reminder, and with each rain more bones and fragments of clothes exposes on the surface. The day cheered up a bit from then. We cycled back to PP and onto a Ferry to one of the many islands adjacent to the city. The juxtaposition is startling; looking over the water you can see skyscrapers and a modern city, all whilst standing on a dirt track next to metal shack. We then embarked on an epic tour of the islands that, by the time we arrived at the hotel, meant we’d clocked over 70km of cycling. Laura cycles at the gym so found it easy, whereas I was a broken man but pleased to have completed it. If you’re ever in PP, we highly recommend you use Phnom Penh Bicycles. The owner Thong was our guide and it’s amazing the work he’s done setting the company up from scratch. He used to cycle 15km a day to the American embassy to use the free internet to teach himself English, and he’s then been teaching himself business and has set up a really professional outfit. He was exceptionally personable and the whole tour was one of the highlights of our trip. We learnt how hand made silk is created. It’s impressive and laborious! Which brings us to today. We decided to try to go somewhere a bit more remote, which we have thoroughly achieved. We are at Chi Phat, an eco-village located in southern Cambodia. To get here, we had to get a bus to the middle of nowhere to then get a 2.5 hour boat down the Mekong. It’s a beautiful place, and really cheap (dinner is $3.50, accommodate is $3-$10), and with lots of excursion to waterfalls, bat caves and see other local flora and fauna. There’s just one problem. It’s raining. Really raining. Monsoon raining. It’s day 2, and other than a brief lull this morning, it’s been non stop. If it stops, we’ll hopefully put some nice photos of waterfalls up. If not, then there’ll be photos of us looking wet and sad. At least the beer is $0.75 a can!